Donations, discoveries and more with our Fiji Holiday Experts! It’s that time of year again; the time that our Fiji Holiday Experts love. The year’s coming to a close and that means one thing to us—it’s almost time for our Bula Bonus Sale! 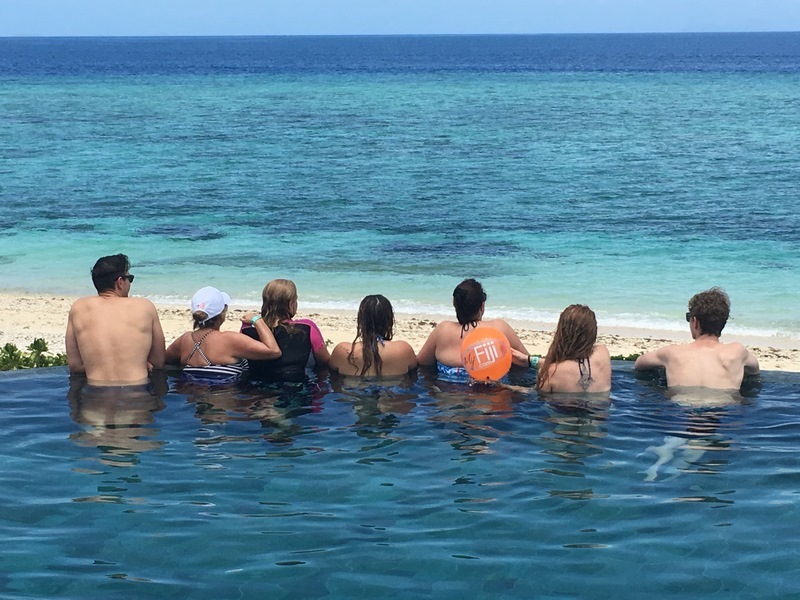 This year, to prepare for the sale and to celebrate another year of great Fiji deals, a group of our Fiji Holiday Experts went back to the place we all love. They said Bula! 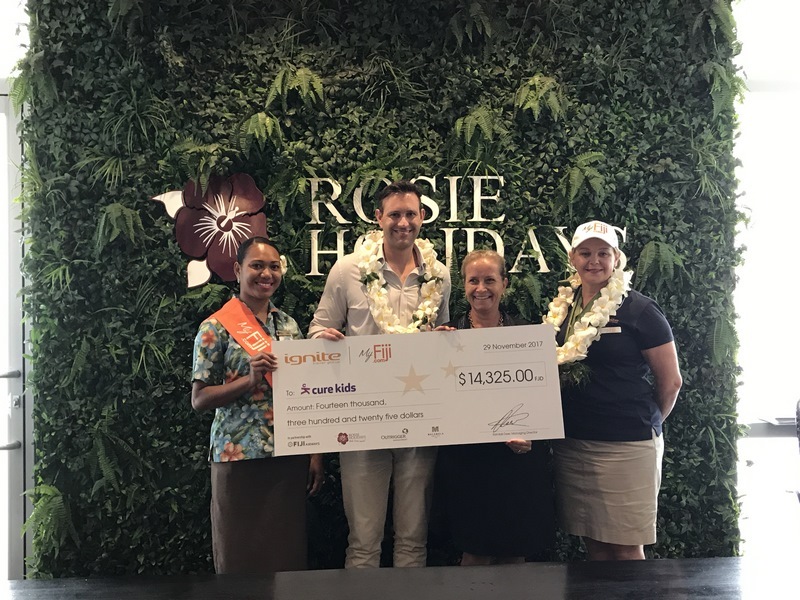 to Fiji, delivered an incredible donation from our fundraising efforts for Cure Kids Fiji, inspected 11 resorts and tried out all of our new and exclusive My Fiji experiences, including Malamala Beach Club, My Fiji Island and the Sunset Cruise, Dinner & Show – Robinson Crusoe Island. For some, it was their first time overseas; for others it was like visiting a dear old friend. Again, Fiji did not disappoint—they’ve all returned home completely infatuated and keen to tell all who’ll listen about the great new deals on the My Fiji horizon. Read on below to find out what they have to say! This trip was Richard’s first time to Fiji and his expectations were well and truly exceeded. From the incredible level of organisation at the airport and marina, to how upmarket Denarau Island was, he was really impressed! 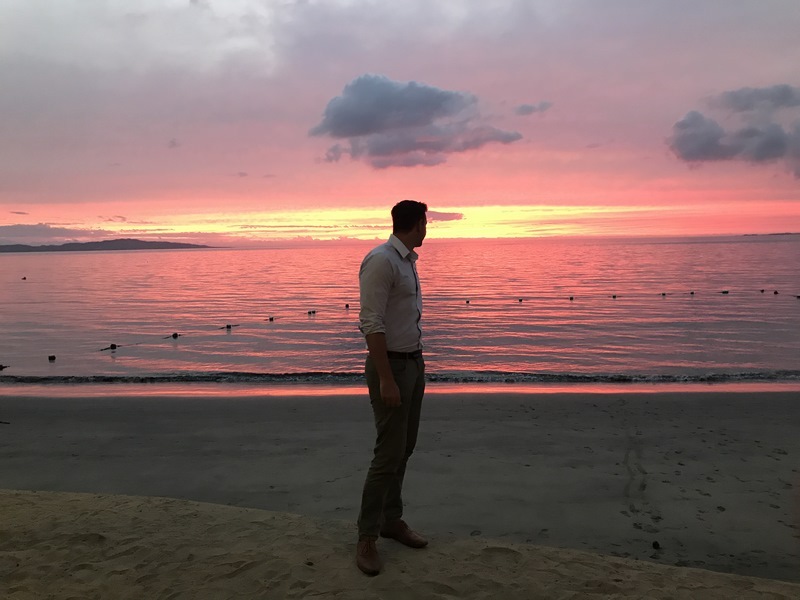 The Malamala Beach Club experience was a clear standout for Rich—no matter what questions we asked him, Malamala featured in his responses, one way or another! The snorkelling there: incredible; the views: out of this world. But the shades of blue were what got him the most—wherever you sat there were so many shades of blue, layered one on top of the other, it was really intense! Rich’s favourite resort was Sheraton Fiji Resort for its location, perfect sunsets, spacious rooms and live music each night at dinner. 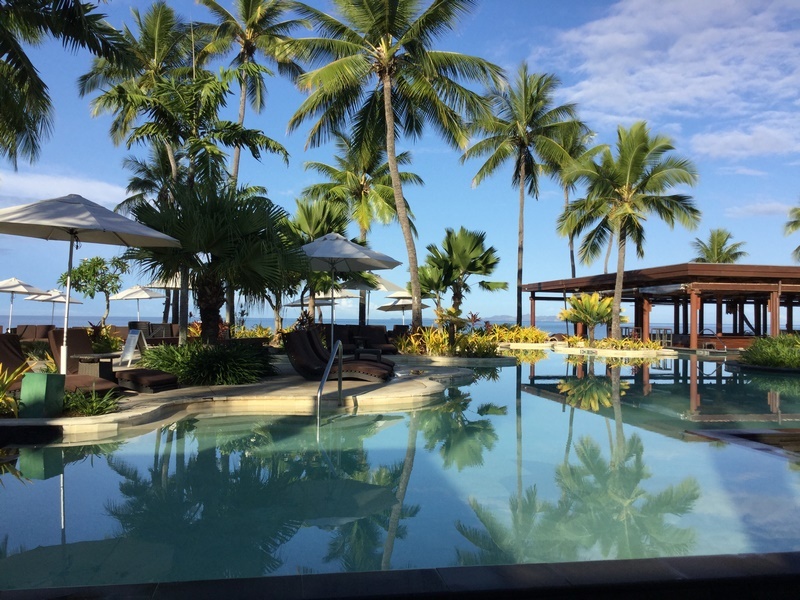 The number of incredible pools at Outrigger Fiji Beach Resort put it in a close second and the pier restaurant and amazing snorkelling just off the beach at Warwick Fiji got it in at third! The interior feel and layout of the buffet, snaking around the kitchen, at Fiji Marriott Resort Momi Bay’s Goji Kitchen & Bar stood out to him. He loved all the water sports on offer at each place they went and the boat ride to My Fiji Island was heaps of fun. On Rich’s bucket list for next time is to ride a jetski from Denarau Island to Malamala Beach club. He’s eagerly planning his next trip back to be Fiji Happy, slow down and destress! Richard’s top advice after the trip is to pack a GoPro for snorkelling, an anti-itch cream in the case of mozzie bites and a poncho in case of an afternoon storm. If you can’t get your hands on one before you go though, Rich says not to worry—if it does rain, it passes quickly and before long it’s sunny and warm again! Lynda loved meeting the locals in Fiji. Learning about their customs and culture was absolutely incredible and she quickly decided that, out of all the places she’s travelled, Fijians are the most happy and welcoming people she’s met. From the moment the group touched down at the airport, Lynda noticed the uniqueness of Fiji and its culture. Wherever she went, she felt welcome and she cannot wait to return to get that feeling back! While her team fit a lot into the 5 days, Lynda says there is still so much of the country to see—it’s one of those places that you can just return to time and time again! 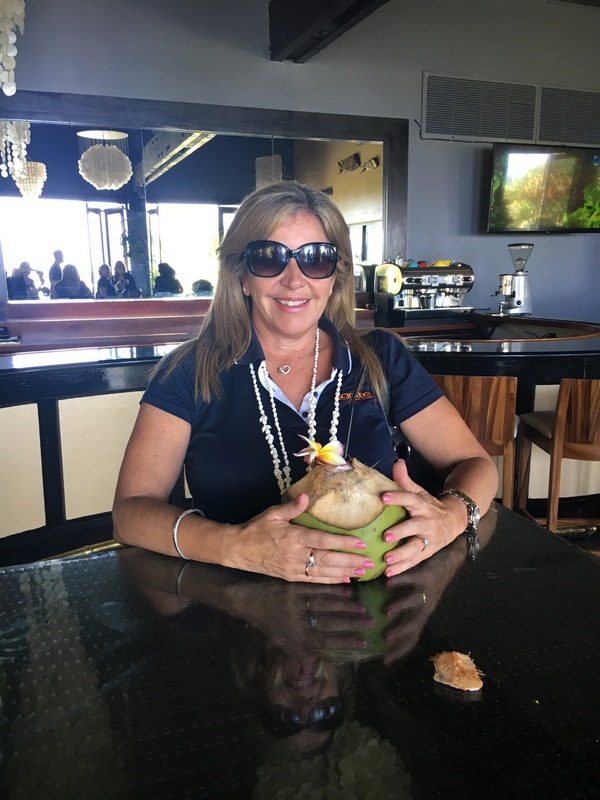 Lynda’s favourite resort was the Sheraton Fiji Resort for the overall feel, followed closely by Outrigger Fiji Beach Resort because, no matter which room type you pick, you’re amongst it all! 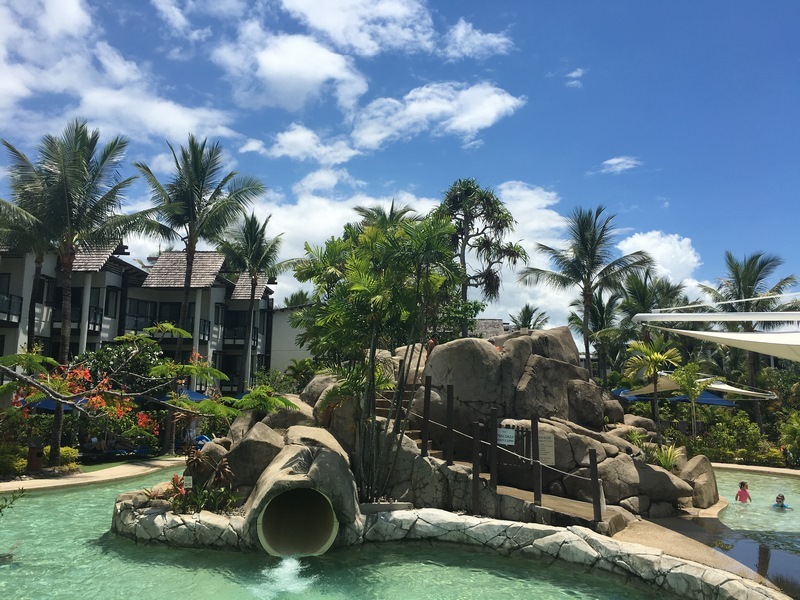 Radisson Blu Fiji Resort stood out to Lynda as an amazing family resort. She also loved the spectacular view from the Quan Spa at Fiji Marriott Resort Momi Bay. 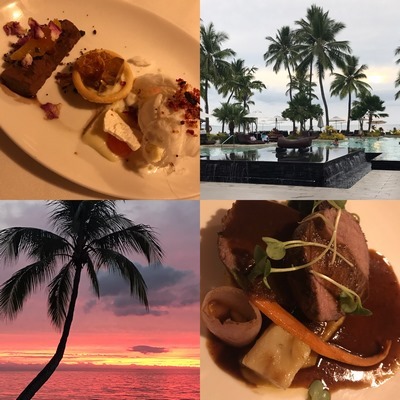 In terms of food, Lynda had two distinct stand-outs on the trip: dinner at the Sheraton Fiji Resort’s Flying Fish and Chantara Thai at Radisson Blu Fiji Resort. Her major regret was that she ate a late breakfast on the morning they were set to dine at Chantara Thai and could not fit as much in as she would’ve liked! When packing for your Fiji trip, Lynda suggests that less is more! With all the amazing pools and snorkelling opportunities, you won’t need as many sets of clothes as you might think. Comfortable shoes are a must, though—they’ll be a lifesaver should you choose to explore on foot! The Fiji trip opened Danielle’s eyes to the range of options in Fiji. The difference between all the resorts, despite their similar cultural offering and overall presentation, really stood out. Her top two resorts, like Rich and Lynda, were the Outrigger Fiji Beach Resort and Sheraton Fiji Resort, though for different reasons! 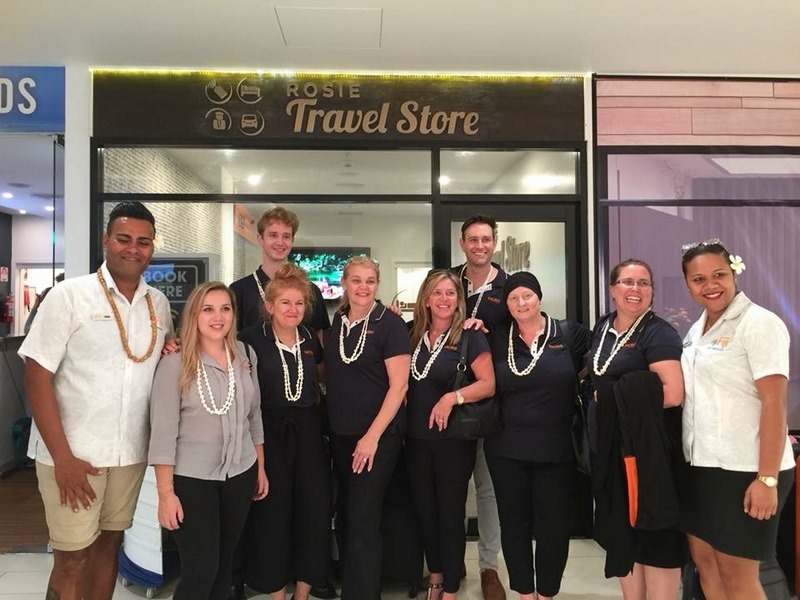 Outrigger, she found, captured the traditional feel of Fiji—an aspect she felt some of the other brand name chains missed in their aim to uphold their overall corporate image. With traditional thatched roof bures and outstanding interior décor (including that on the ceilings), Outrigger captured the essence of Fiji. The general feel was that of “holiday vibes”—Danielle really felt like she could relax there amongst the gorgeous pools and tropical settings. There also seemed to be something for everyone, with kids activities, an adults-only pool and the incredible hilltop Bebe Spa. The view from the hill, and the adults-only sunken lounge bar there, was incredible and she’d definitely not complain if she got stuck there! The Bula Bus on offer from the Sheraton Fiji Resort stood out to Danielle too. 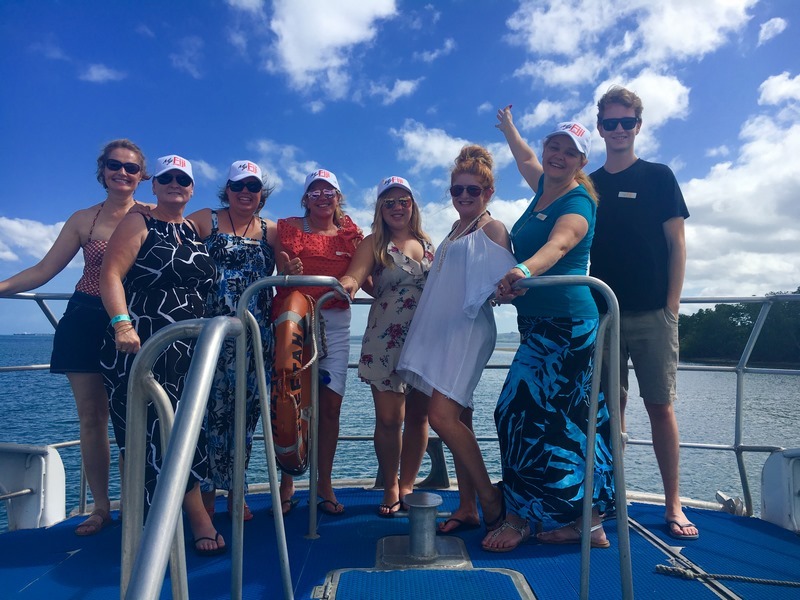 Being able to get to and from the Denarau Marina with ease was great and it also made her feel like she wasn’t locked into just one resort—it was easy to get out and explore! 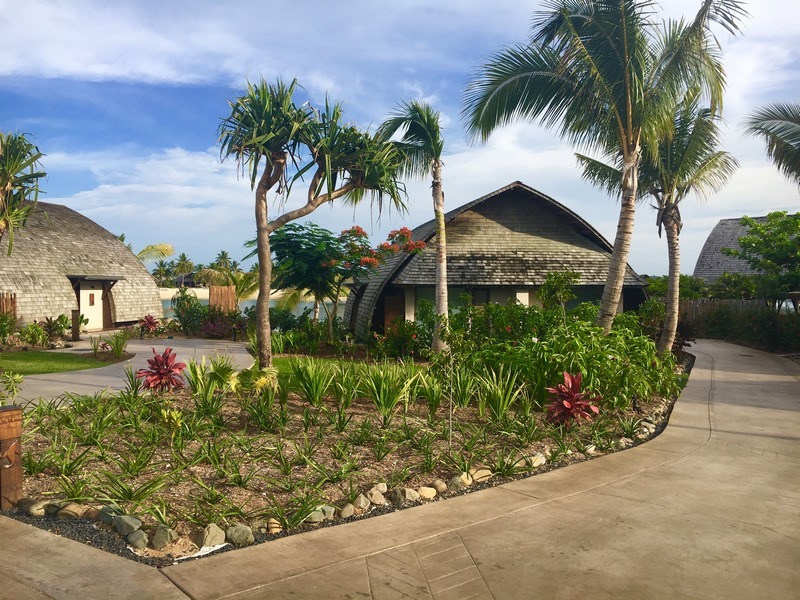 Fiji Hideaway Resort & Spa, despite its older style, had lovely airy rooms, an amazing range of activities and a warm Fijian welcome that was so beautiful it made her cry! Despite this huge tick in Hideaway’s favour, the food at Sheraton Fiji Resort and Outrigger won her back over. The sand-floor at Sheraton’s Flying Fish restaurant was authentic and relaxing, her salmon was cooked to perfection and the music and overall vibe were true stand outs. 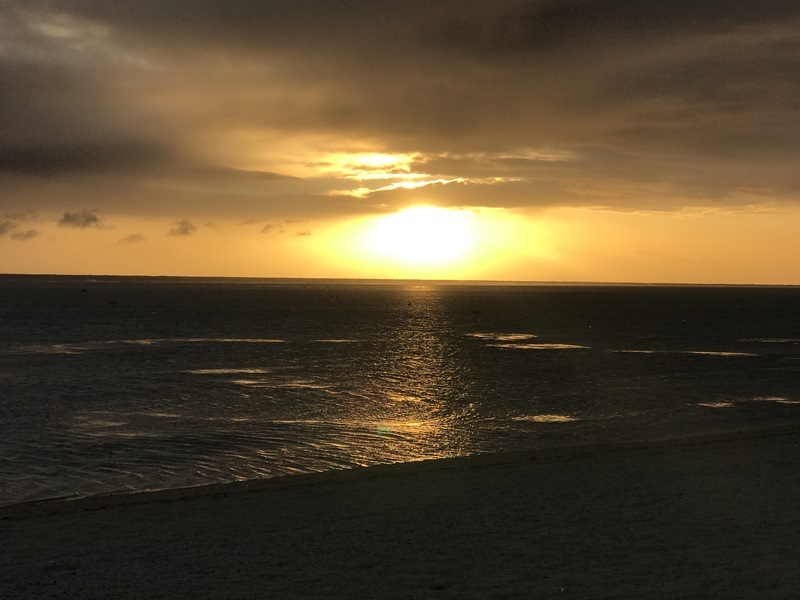 At Outrigger, Sundowner Bar & Grill had the best sunset views and the food was fantastic! Danielle would love to return to Fiji with her family because she knows it’d be right up their alley. When she returns, she’ll opt for kava and cultural ceremonies at the lesser-known resorts or on Robinson Crusoe Island (more authentic) and she’ll take a battery reserve attachment for her mobile. With so many photo opportunities, she found that her phone battery died pretty quick! 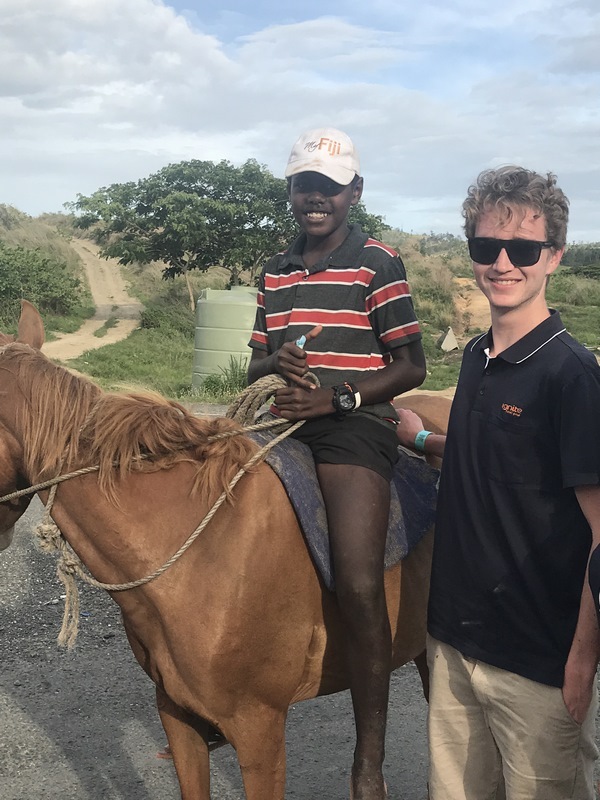 Kaine caught the travel bug in Fiji—from the views, to the beach clubs, the food and the super friendly people, it wouldn’t take much to get him to go back! Malamala Beach Club was, by far, the best thing he did on the trip. The mix of being on a tropical island with all the benefits of a luxury pool and bar was incredible—the fact that the group had a private cabana on the beach made it all even better! The snorkelling was great because the water was so clear. The only thing that would’ve made it better was being able to spend more time there (and luckily you can if you travel with My Fiji!). Despite the view being amazing at Malamala, Kaine’s favourite was at Warwick Fiji. There, you could see the beach from every room, plus you could kick back with a drink in the afternoon at the Sunset Bar to watch the sun set. Sofitel Fiji Resort & Spa was Kaine’s favourite. To him, it was a great all-rounder with nice rooms, great views, enough space to accommodate all types of people and the Waitui Beach Club was amazing! Outrigger Fiji Beach Resort came in second for him because of the view over the ocean from Sundowner Bar & Grill at dinner. The fire dancing on the beach was great too and he thought it was great when the staff sang their “Isa Lei” song. 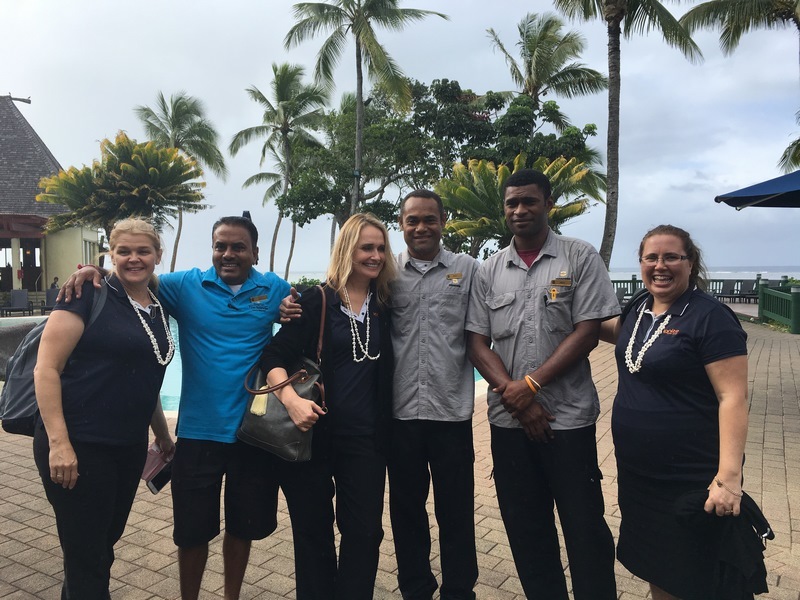 The friendliness of the staff at the Outrigger, Kaine found, carried over to the Fiji Hideaway Resort & Spa (also on the Coral Coast). While the resort may not have been as high-end as its brand name neighbours, it had a great atmosphere! Kaine’s best advice for anyone travelling to Fiji is to allow time to adapt to “island time”. By slowing down and going with the flow, you’ll enjoy yourself better and won’t stress the small stuff. Another thing to remember is that while Fiji is a tropical island, it can get colder at night—pack a light jacket, just in case! Fiji never disappoints, according to Tracee, and this trip was no different! To her, it is the perfect destination for every traveller, no matter what budget or what you want to do. Relax, tour, or try out activities—you can do anything in Fiji and it will all be topped off by the unconditional kindness of the local people! Tracee’s favourite experience was Malamala Beach Club. The My Fiji guides were incredible, the food was amazing and the scenery and snorkelling were absolutely spectacular! Similarly unfaultable, was her experience at the Sheraton Fiji Resort. The whole place boasted a beautiful ambiance, it was clean and classy, the staff were incredible and the food was outstanding. Each of the rooms at the Sheraton Fiji were spacious and comfortable. The views were breathtaking too—especially the sunsets! Tracee’s second favourite resort was Sheraton Denarau Villas. Surrounded by lush gardens and boasting large fully self-contained apartments, Tracee felt the resort would be perfect for families! 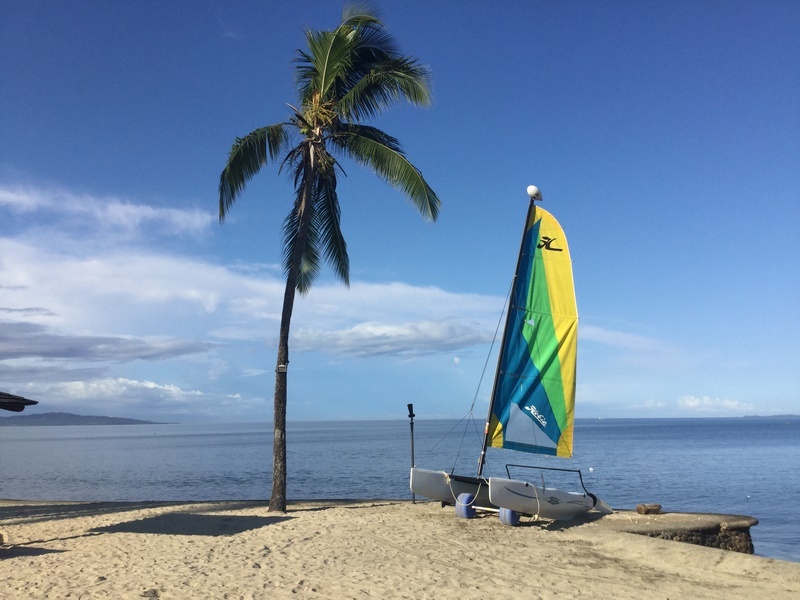 Radisson Blu Resort Fiji was similarly family-suited, with heaps of activities for all ages. The rooms here were spacious too, the restaurant catered for all tastes, the staff were wonderful and the overall resort was overwhelmingly beautiful! Despite the exceptional quality of food at Radisson Blu, Tracee’s favourite meal was the seafood at Sheraton Fiji’s Flying Fish restaurant. And her number one packing tip for Fiji travellers? Comfortable shoes! Always be prepared for some long days exploring! Fiji is like home for Hayley—the amazing culture, people, food, hospitality and overall atmosphere have had her coming back time and time again and she’s still keen to return after this latest visit! 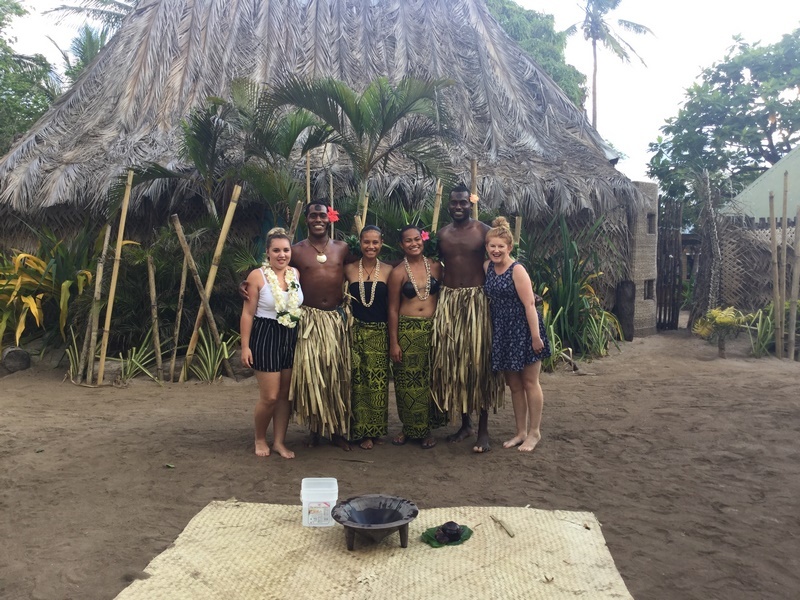 Her favourite part of the trip was being able to experience the culture by dancing with the Fijian people. 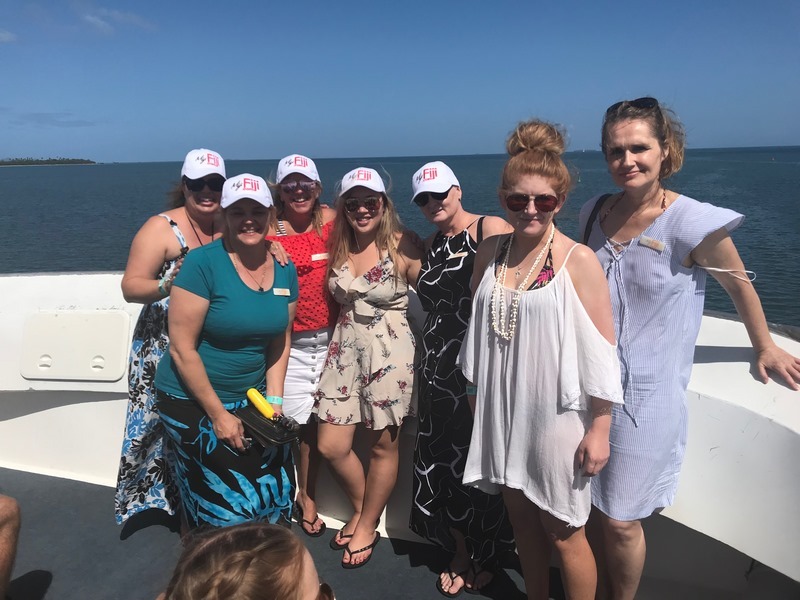 She also really loved meeting the My Fiji resort partners and suppliers on the ground—their passion and experience was incredible! The food was amazing at each place they went, but a true stand out was the Flying Fish at Sheraton—the mushroom risotto was to die for! Like so many travelling with her, Hayley found Malamala Beach Club phenomenal! It was absolutely breathtaking and, hands down, the best day trip the did! 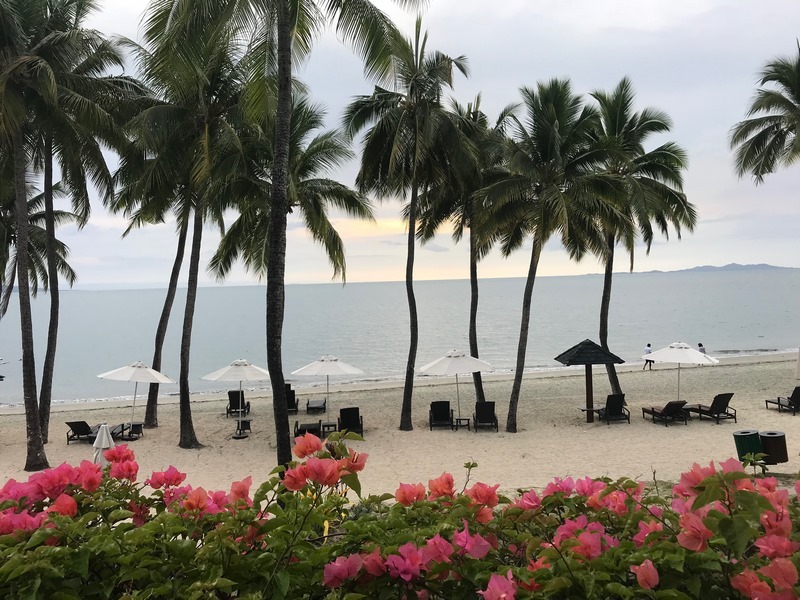 Her favourite resort was Sheraton Fiji Resort because of the restaurants, the staff and the overall feel of the resort—everything you could need was there, ready and waiting! Outrigger Fiji Beach Resort came in second because of the hospitality, accommodation and amazing breakfast. 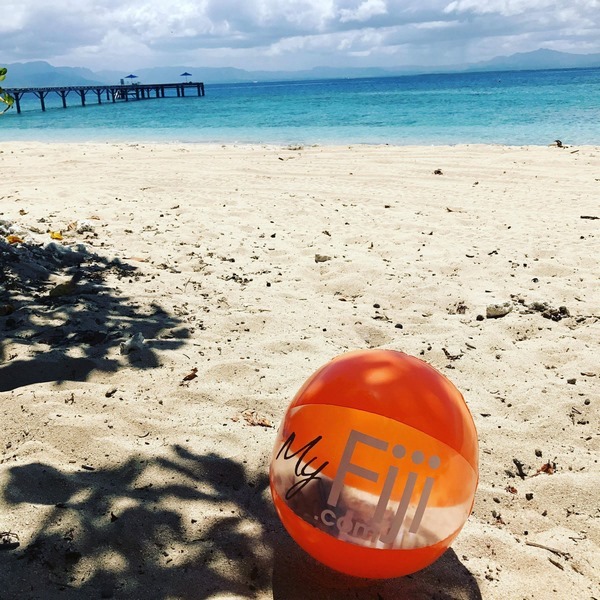 She also liked the rooms at the Fiji Marriott Resort Momi Bay and how the buffet provided a great range of options for all dietary requirements. Hayley’s number one packing tip (and after multiple visits her advice should not be ignored!) is to pack light. Fiji is humid, yet breezy. Think light layers and you won’t go wrong! For Alicia, this Fiji trip taught her things she didn’t know about herself. At Sheraton Fiji Resort’s Flying Fish restaurant, she tried foods she’d not normally have (and loved them! ); she learnt the importance of taking more than one pair of swimmers to maximise time spent working on her sun-tan; she learnt to let go and sing songs with the locals, getting to know them over kava; and she discovered an all-important secret to bring back with her—that surrounding yourself with positive, friendly people inspires you to adopt those vibes day to day! 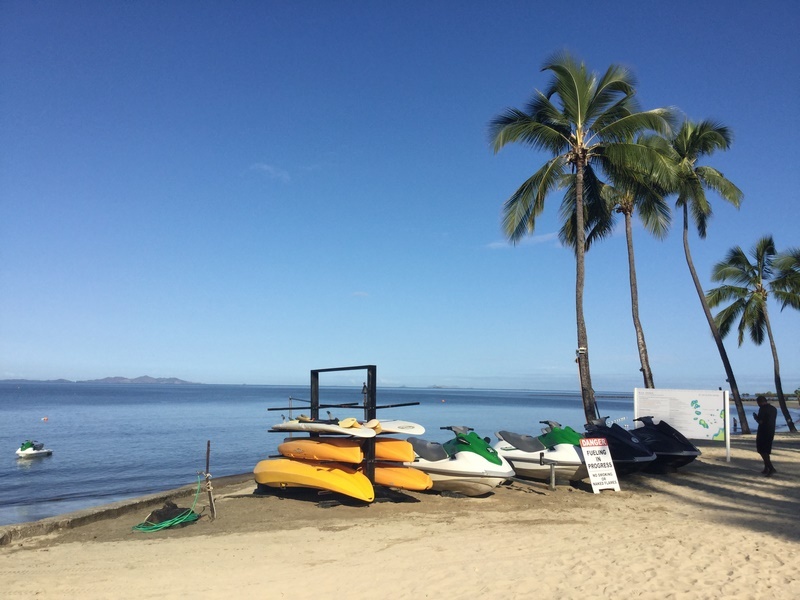 From the weather, to the clear water for snorkelling and the close proximity to Australia, Fiji had so many perks for Alicia and she’d definitely make the trip back! 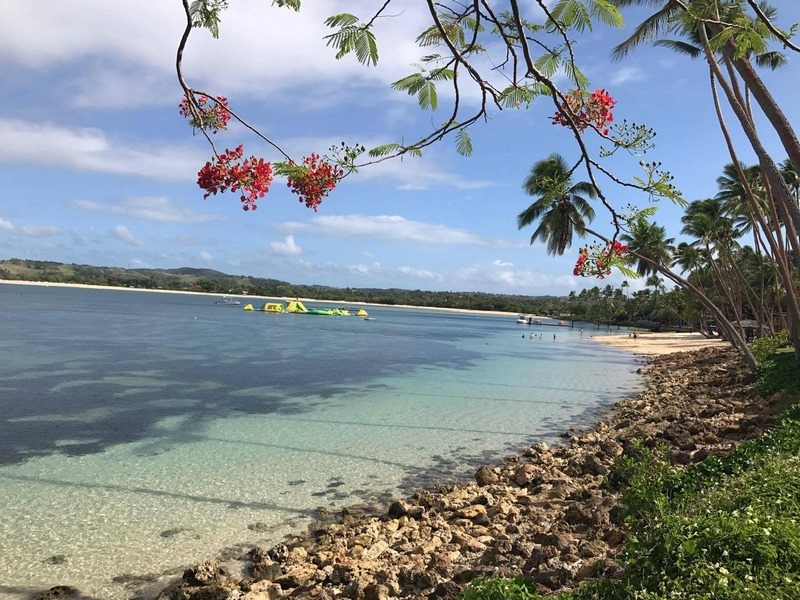 Alicia’s favourite resort was actually three resorts—the Starwood Group on Denarau Island: Sheraton Fiji Resort, Sheraton Denarau Villas and The Westin Denarau Island Resort & Spa. These three resorts, Alicia found, catered for every traveller imaginable—from big groups, to couples, those with children, those who want to “do” and those who want to relax! The food was to die for, especially at Flying Fish and you’d never get bored. 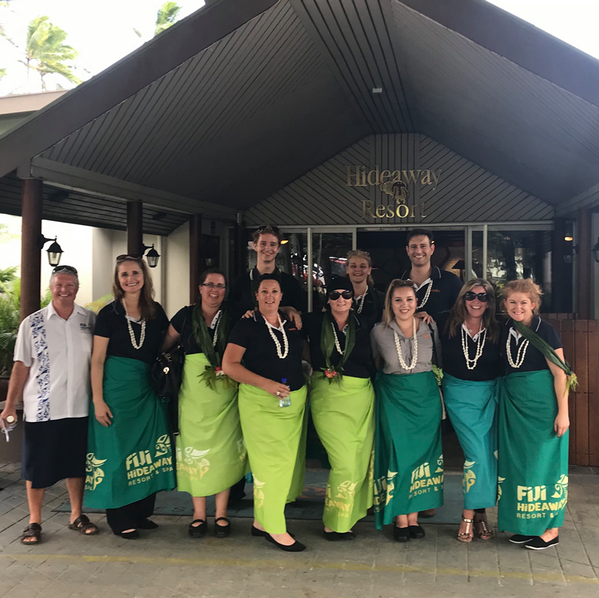 Next up for her was Fiji Hideaway Resort & Spa for the culture, the food, the kava and a good Bula! The beautiful detail in the lobby at Warwick Fiji caught her eye and the Sofitel Fiji Resort & Spa, in her opinion, had the best overall set up (you can’t go past separated adults-only and family wings!). The best bit of advice Alicia has is to pack light clothes that allow you to feel the cool breezes and to make the most of your chance to get a nice glowing tan! If you’re travelling to Fiji for the first time, stay at Denarau and opt for a Malamala Beach Club 7 Day Pass. This way you’ll get the best of both worlds—you’ll stay in luxury, be close to everything and you’ll be able to enjoy the most incredible snorkelling around the islands! 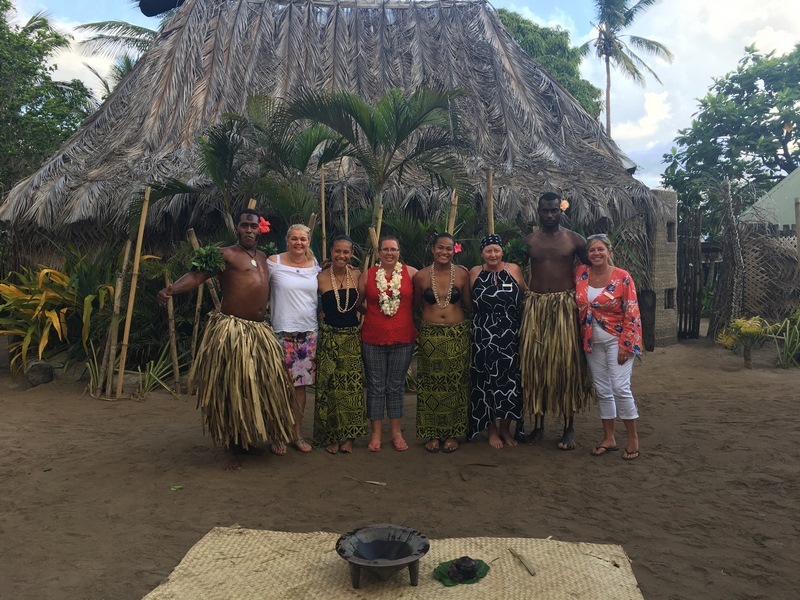 This Fiji trip was full of surprises for Elisabeth and she learnt a lot over the 5 days. For starters, the friendliness of the people absolutely blew her away! She also discovered more about Fiji’s population, being made up of 60% Fijians and 40% Indians. Both of these groups, Elisabeth told us, were full of the kindest people she’s met and they really made the trip great! Everywhere the group travelled, they were met by friendly, extremely informative hosts. They were shown such great hospitality and nothing ever seemed too much. Malamala Beach Club was her favourite thing they did—she found the island so beautiful and relaxing and there were so many things to do. From snorkelling, to kayaking and swimming in the infinity pool, Malamala made for the most amazing adventures with her team! 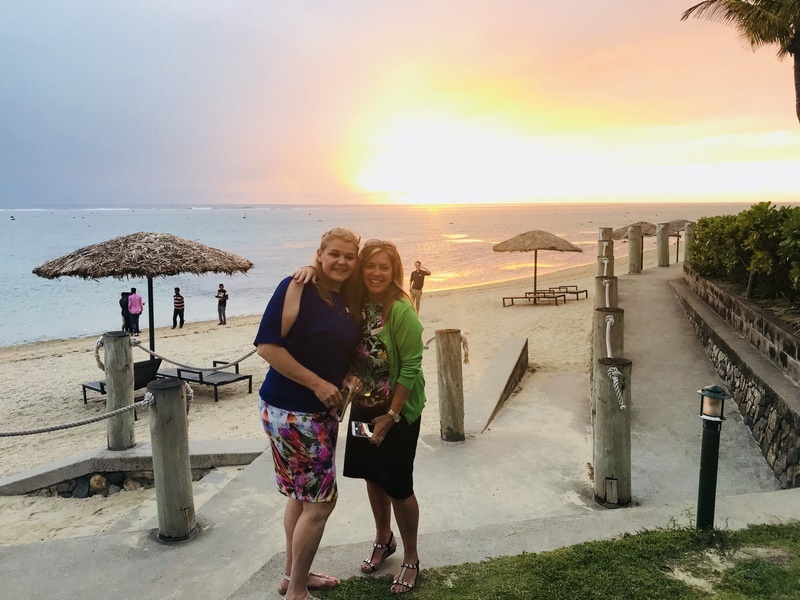 Elisabeth’s favourite view was the sunset at the Sheraton Fiji Resort—it was absolutely gorgeous! 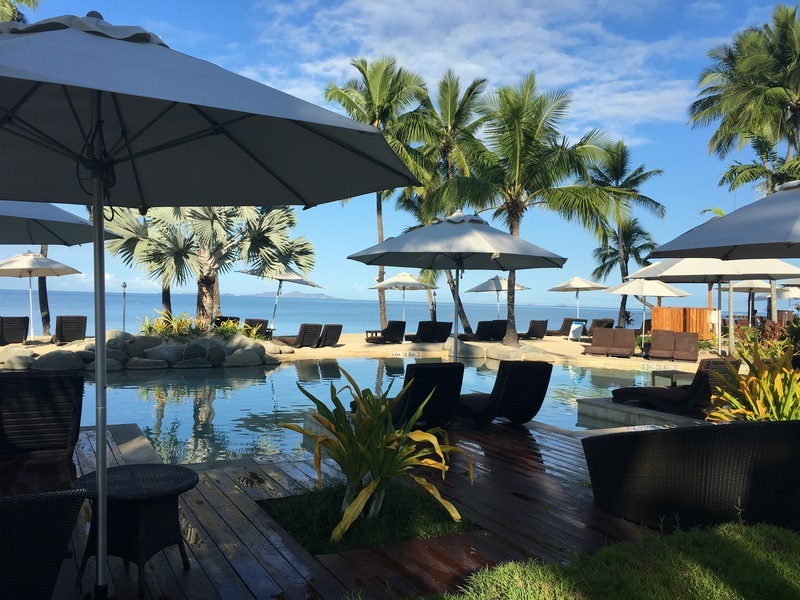 Combined with the large rooms, comfortable beds, exquisite pools and beautifully presented meals, Sheraton Fiji Resort easily became her favourite too! 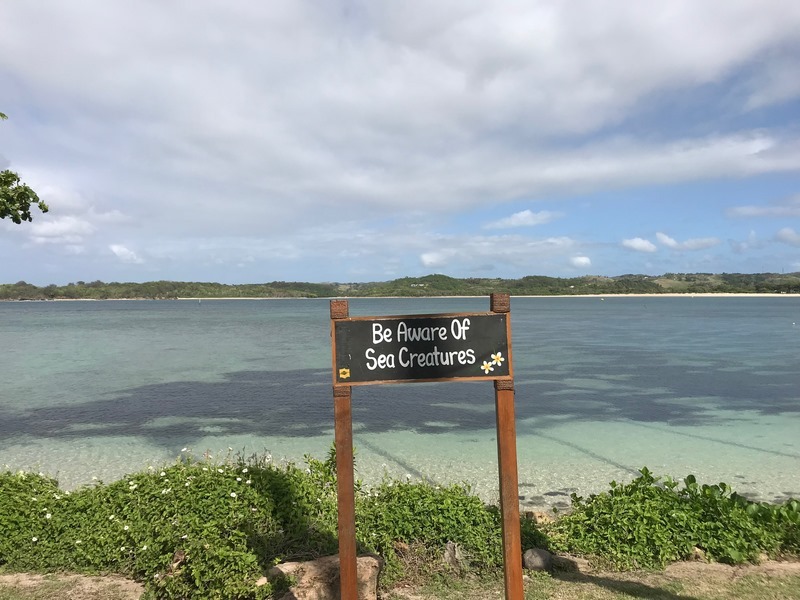 This was a surprise in itself, given the Denarau Island location—prior to this Bula Trip, she’d never understood why people would want to stay there and not the Coral Coast! Now, especially with exclusive tours to Malamala, My Fiji Island and Robinson Crusoe Island, she completely gets it! On the Coral Coast, Elisabeth’s favourite resort was the Outrigger Beach Resort & Spa. The landscaping and views stood out most, plus the fact that the pools were all open 24/7 was pretty incredible! In terms of advice, a message similar to the others came from Elisabeth: pack less! With so much snorkelling, swimming and amazing spas around, you’ll need less changes of clothes than you think! 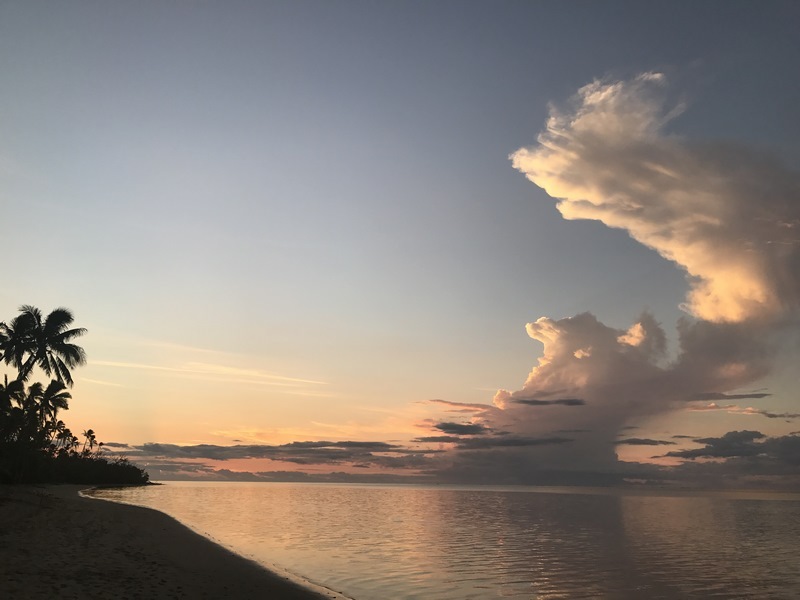 Lilly would summarise Fiji as a haven of pristine white sandy beaches, warm crystal clear water, coconut trees gently swaying in the breeze and a place where you can just kick back in a hammock with a cocktail in hand. 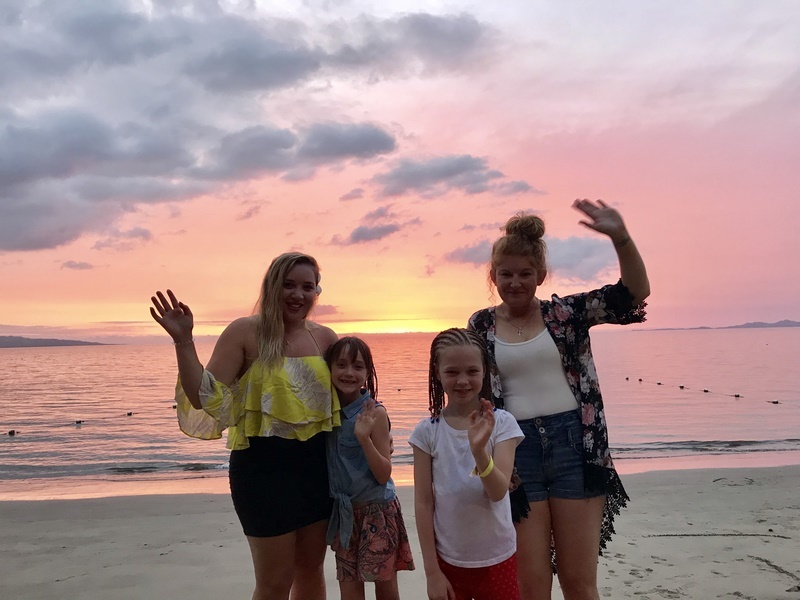 Add to that the warmth of the locals, the stunning scenery off the shores, the fantastic hotels and the major perk of a short flight time (from Australia) and she’s definitely keen to go back for more! Lilly loved how, wherever they went, the locals would break out into song and dance. The overall vibe was one of happiness and peace and she’d love to share it all with her family! Lilly’s favourite resort was the Outrigger Fiji Beach Resort. It’s 5-star facilities, authentic Fijian design and architectural style, 24/7 pools, separate adult’s day spa area and great panoramic views really stood out. On top of that, the rooms were spacious and there were plenty of upgrade options, making it the ideal resort for absolutely everyone! Second in line was the Sheraton Fiji Resort. 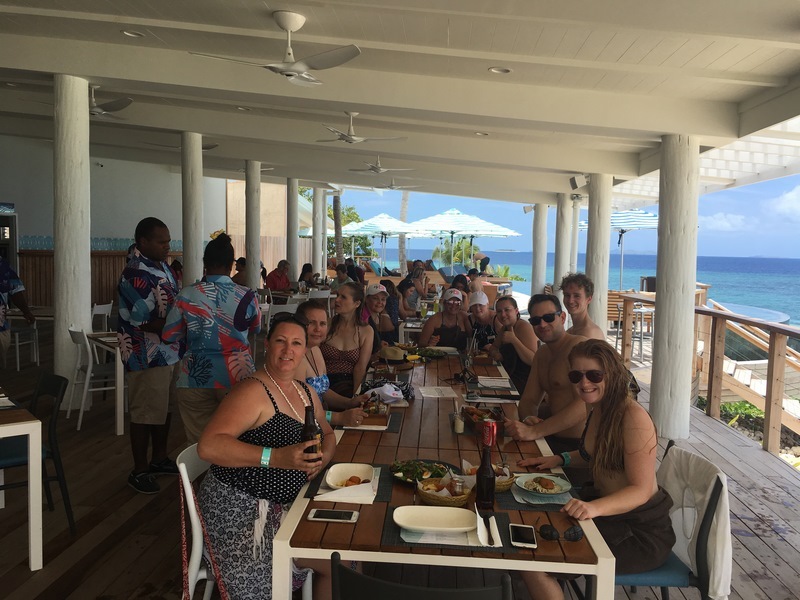 The fact that guests could access all 14 dining venues and 6 pools across the Starwood Denarau Island properties (including Sheraton Denarau Villas and The Westin Denarau Island Resort & Spa) was a major selling point! Taking light clothing, insect repellent and a good book to Fiji is a must, Lilly informed us. She stressed that when packing, less is more and Malamala Beach Club is a definite must-do! It is peaceful and picturesque—not over crowded at all. If you’re looking for somewhere to unwind and relax, Malamala is your best bet! Malamala Beach Club was the highlight of Grace’s Fiji trip. 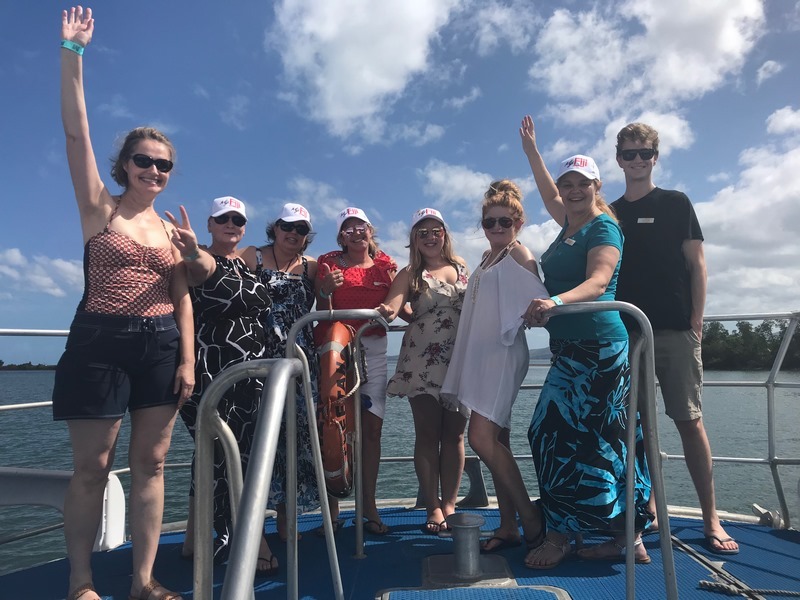 From the views toward the island as the team crossed from Denarau Island by boat, to the clear water and amazing fish when they went snorkelling, she’d recommend that everyone experience it for themselves! 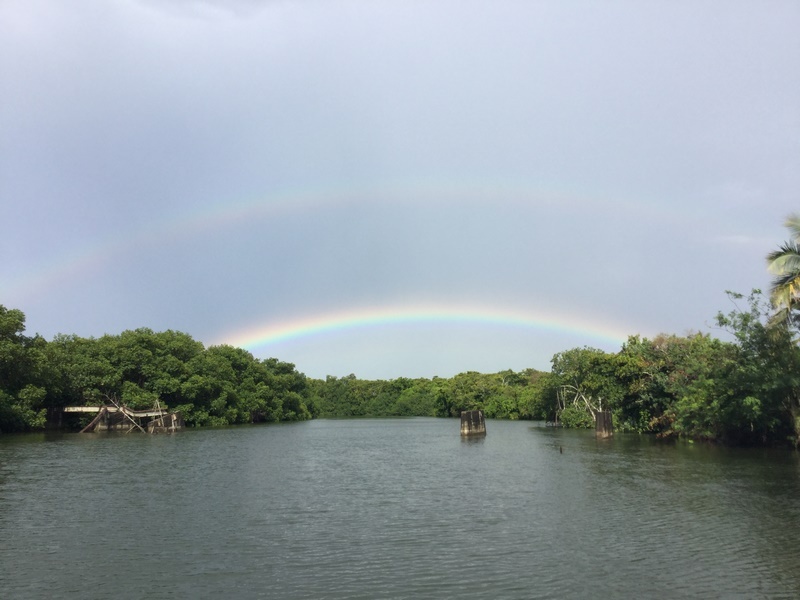 Grace said that, upon arrival to Malamala, it felt like you were visiting your own private island. The sand was white and the sea was the clearest blue she’d ever seen, plus Simon (the team’s personal VIP assistant) was the perfect gentleman and extremely impressive at his job! 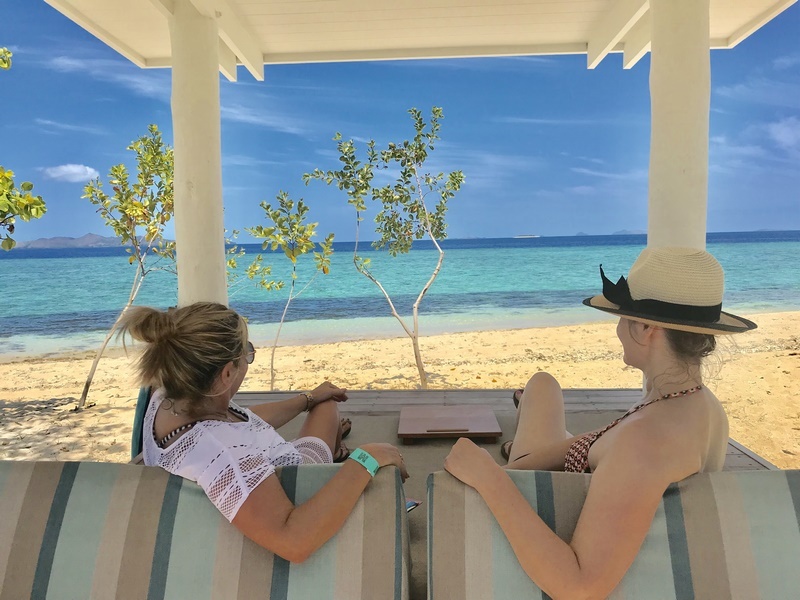 The snorkel masks and fins were in excellent condition, the bathroom and shower facilities were 5-star quality and the private cabana and service within it was the icing on the cake! She ate fresh fish for lunch, gazing out across the ocean; tried out SUPing; and got to talk to the staff about their villages and family life. Her next favourite Fiji moment was at Warwick Fiji. The resort had a special buzz about it and, from the moment the team entered, they couldn’t help but be drawn to the balcony to take in the stunning ocean views. Warwick Fiji, Grace said, catered perfectly for both adult travellers and families. The FREE kids club that ran for 9am to 9pm was a massive plus and there were heaps of activities to enjoy (kayaking, SUPing, archery, squash and more). Sheraton Denarau Villas also stood out to Grace. She loved that each villa was fully self-contained, with kitchen, washing and drying facilities. Being able to access all of the other Sheraton and Westin facilities was great too, plus the ease of transport on the Bula Bus was a clear highlight! Grace’s top piece of advice differed to most of the other people on this Fiji trip. Where the others suggested packing light was the way to go, Grace says to take a bigger suitcase! With so many lovely Fijian people around and plenty of day tours to get out enjoy, you’ll always end up with a collection of things that you want to bring back! Have our Fiji Holiday Experts got you all inspired to say Bula! to Fiji? Find your next Fiji Hot Deal here or contact us!